To see these pieces in action, check out my Amazon Haul Instagram Story! 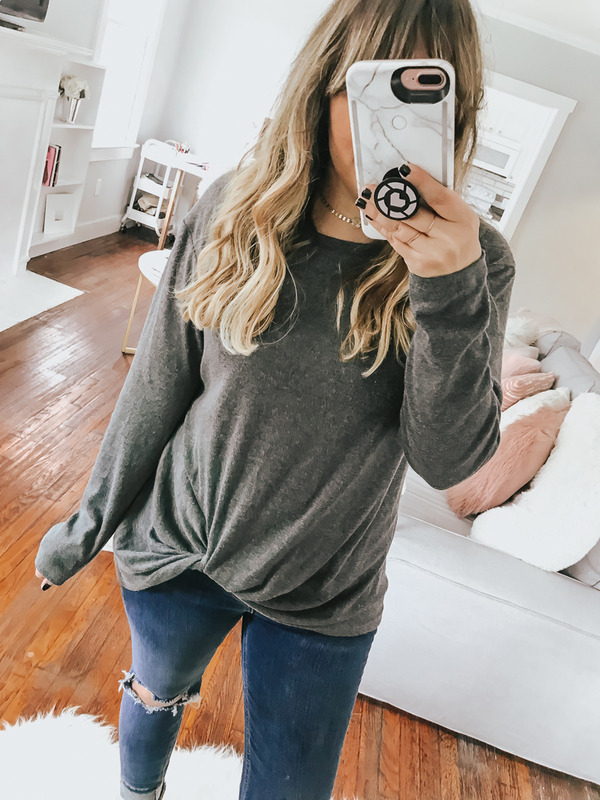 Twist top in greyish-green, $20.99 + prime shipping || available in 3 colors. Wearing size medium. 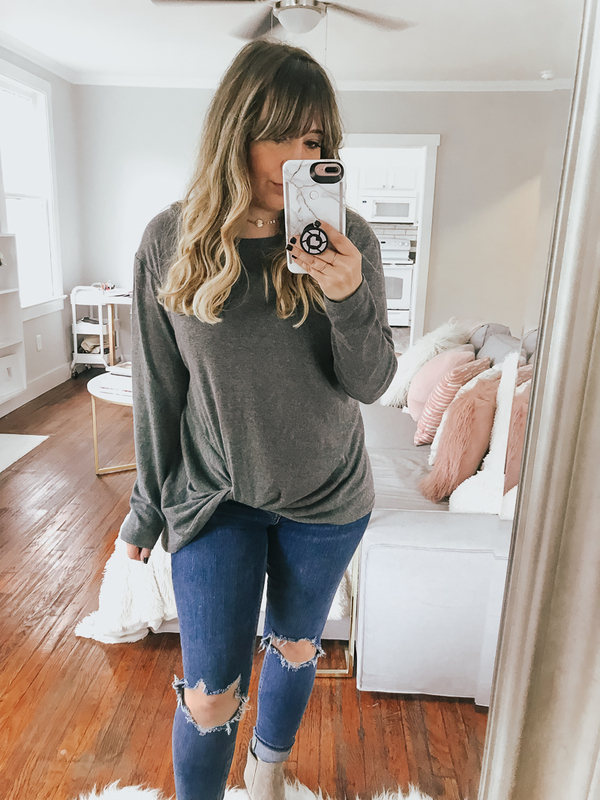 Super soft, so comfy great layering piece for fall. Like that it’s longer in the back. Would also pair great with leggings! 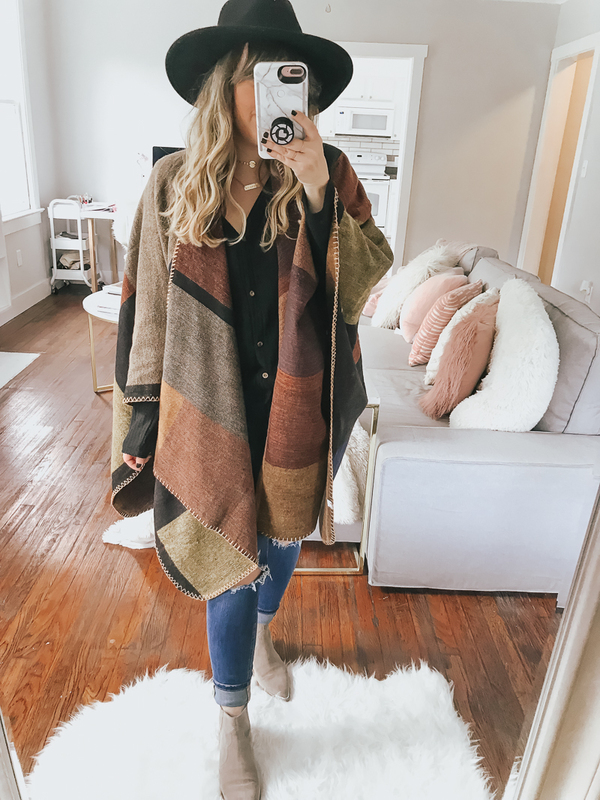 Reversible oversized blanket poncho in khaki, $23.99 + prime shipping || available in 4 colors. LOVE this so much, probably my favorite piece from this order! So cozy and soft, I am impressed by how high quality it is! So soft, NOT at all itchy. 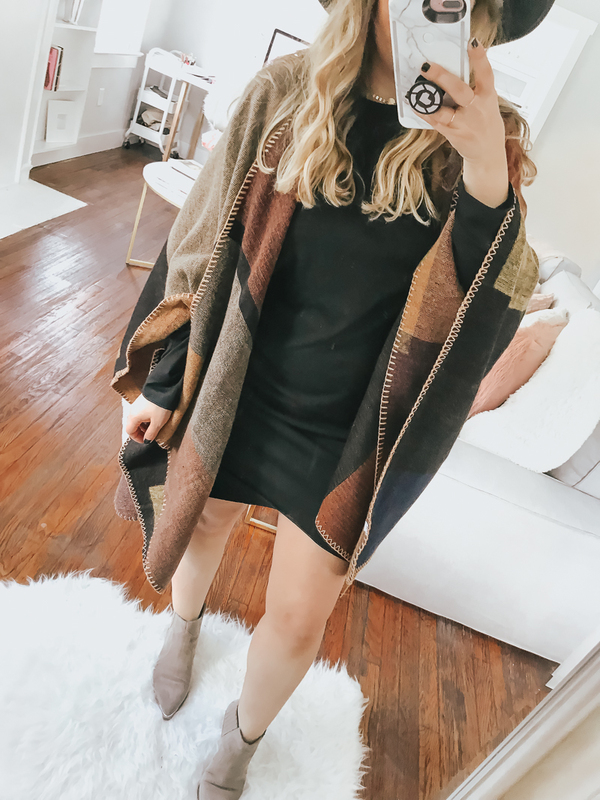 I have a much more expensive poncho that I got a couple of years ago from ILY Couture and it feels just like that one, for a fraction of the price! I went for the khaki color, loved the mix of neutrals and the pop of navy. This baby is super versatile, pairs amazingly well with jeans, leggings, even little cozy dresses. V-neck slub tank top, $20.95 + prime shipping || wearing a size medium. LOVE this loose, easy tank. Makes a great layering piece… can be worn tucked in or it’s definitely long enough to pair with leggings. Has a really pretty criss-cross back and a really flattering fit! So soft and feels really high quality. 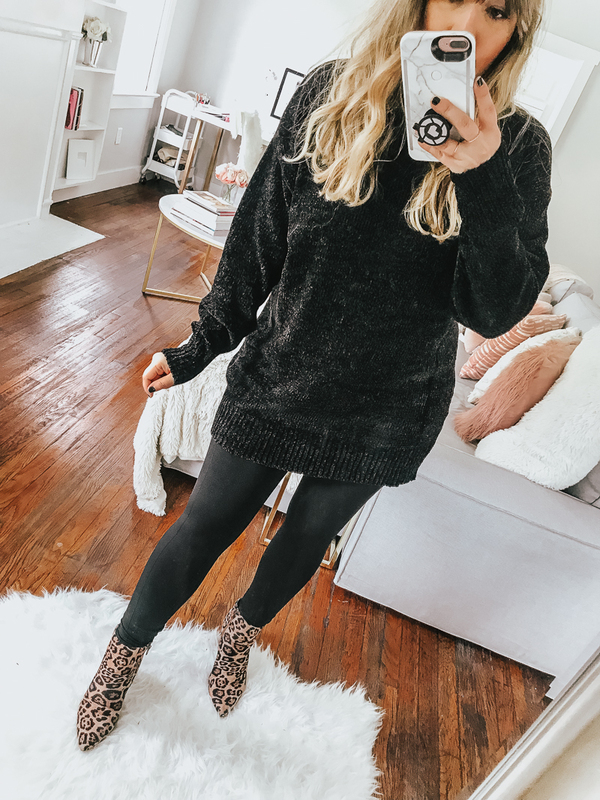 Knitted off the shoulder sweater dress, $9.99 + prime shipping || wearing a size large. This runs teeny tiny. Looks nothing like the photo… was hoping for a loose, easy, oversized fit. The result is definitely more sausage casing-y than I would hope for lol. Very thin, not good quality, fit is off… I say skip this one. (Maybe can get away with it in a black if you’re super skinny!) My friend told me that she wore her custom photo watch with this outfit. Chenille pullover, $29.99 + free shipping || available in 3 colors. Wearing a size medium. 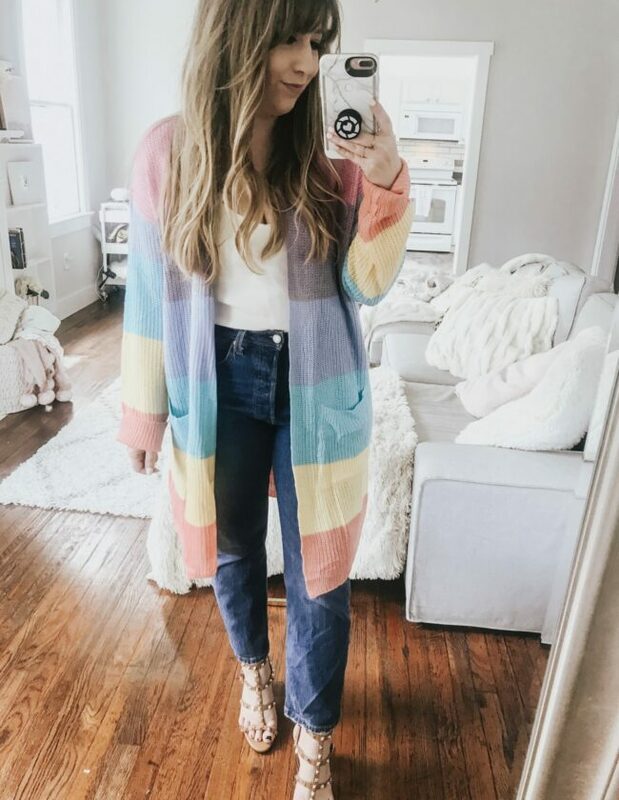 LOVE this oversized chenille sweater. 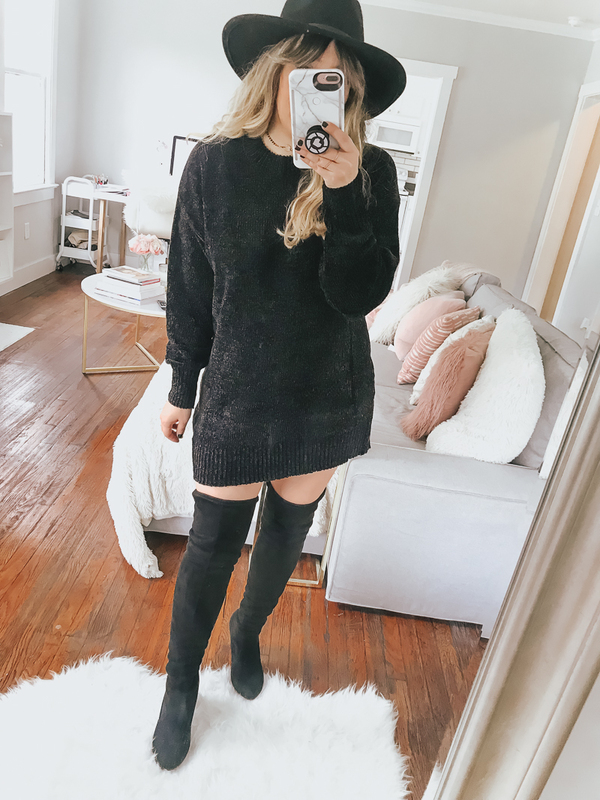 You can wear it as a sweaterdress if you are petite like me (I am 5’2) or pair with leggings if you feel uncomfortable with the length. 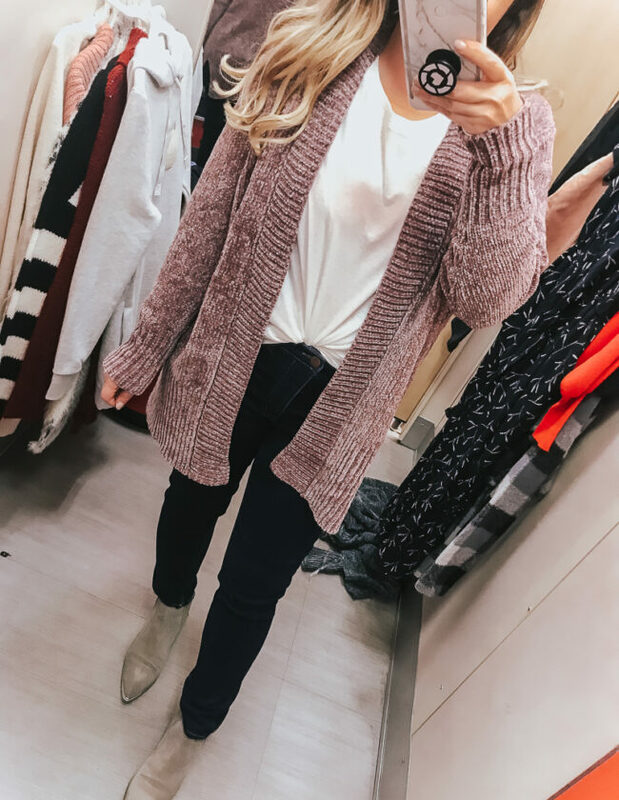 SO soft and cozy, perfect for the fall and winter. Really nice quality, very buttery soft. Black bodycon irregular hem sheath t-shirt dress, $14.99 + prime shipping || available in 4 colors in the long sleeve, 8 colors in the short sleeve, and 7 colors in sleeveless. I’m wearing a size large, but could definitely have sized down to medium… depends on the fit you want! If you want a super bodycon fit, go with the smaller size. I was nervous it was going to be too tight and I would look like a sausage casing! The fit is perfect in the lower body area but slightly bigger on the top half. I actually ordered one of the sleeveless styles also, but it was accidentally delivered to the house in Miami instead of to Savannah, so I’ll post it in the next couple of weeks! Premium high waist slimming compression leggings, $19.50 + prime shipping || THESE. LEGGINGS. I feel so skinny in them! They are so smoothing, so flattering and SO COMFORTABLE! They had a ton of great reviews and I can see why. You can wear them to work out (they have moisture-wicking technology) or just to run errands. They have slimming panels and are just really high quality. For the price, these are a steal! So– what did you think?? Are you feeling these affordable Amazon fashion pieces? Are you into these types of posts? 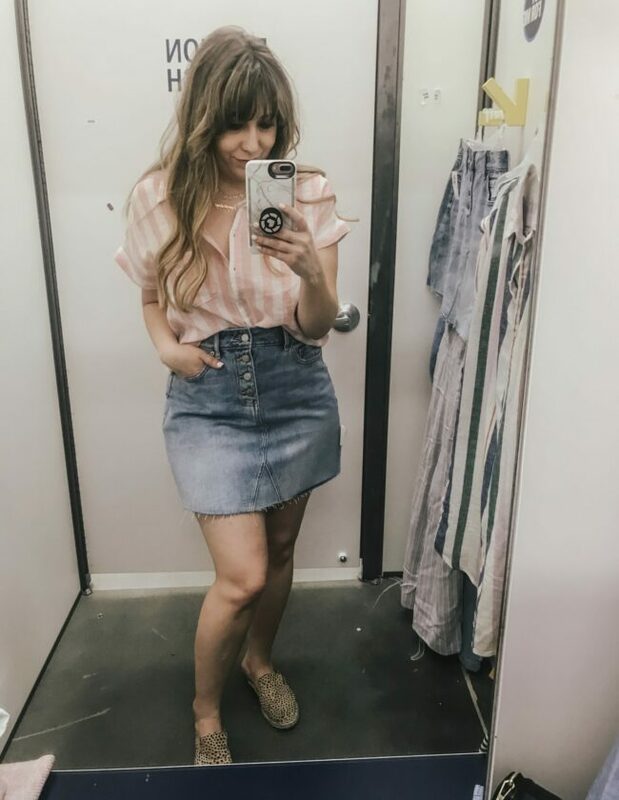 I think I’m going to be doing it monthly… placing a big Amazon order and sharing my thoughts on what’s a must-have and what’s a pass. I know that I personally love these types of posts! Which of these pieces are your fave? Hit the comments and let me know!